Amanda Bao, assistant professor of civil engineering technology, found that re-orienting the strong axis of H-piles—the dense, steel piles used to support bridge spans—from bridge longitudinal direction to the alternate direction is one way to increase load capacity. H comes before I in the alphabet—and when referring to bridges. A new study by researchers at Rochester Institute of Technology indicates that a 180-degree shift in the direction of the H-steel pile foundations in bridges could add new life to the structure and increase load resistance and capacity—even in the event of earthquakes or tsunamis. Amanda Bao, assistant professor of civil engineering technology in Rochester Institute of Technology’s College of Applied Science and Technology, found that re-orienting the strong axis of H-piles—the dense, steel piles used to support bridge spans—from bridge longitudinal direction to the transverse, or alternate direction, is one way to increase load capacity. The recent report by the American Society of Civil Engineers gave U.S. infrastructure low marks, highlighting roads and bridges across the country considered structurally deficient. The likelihood of older bridges remaining serviceable takes on a different perspective when earthquakes or tsunamis are added to the mix, Bao says. The work could also make an impact in the national conversation about the need for improved infrastructure—bridges, culverts, roads and highways—across the U.S. The average age of bridges in the U.S. is 42 years old, and one in nine of the nation’s bridges were categorized as “structurally deficient,” according to the ASCE. Tsunamis often follow earthquakes. 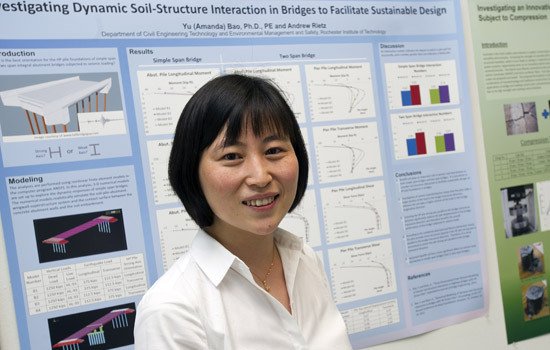 The rushing water disrupts soil around the base of bridges, and through Bao’s work, the combination of soil resistance and pile resistance is being explored together. Prior to coming to RIT, Bao worked as a design engineer for Jacobs Engineering Group, based in Denver, Colo. Bridge design criteria varied from state-to-state. Her current work focuses on bridge design in seismic zones, and is supported by an RIT Provost’s Grant/Strategic Acceleration of Research Award. Sustainable design theory is becoming popular as an alternative to meet the demand for increasing the lifecycle of bridges and other foundation infrastructure. Bao has incorporated aspects of using sustainable materials such as hybrid nano-fibered concrete into the structural design process. By understanding how these two elements are related, design engineers will be better able to understand how the bridge behaves during earthquakes – and they can build structures that survive, she explains.